Home » Blogs » The Progressive Caucus FY 2019 "People's Budget"
The Progressive Caucus FY 2019 "People's Budget"
The Congressional Progressive Caucus (CPC) released its “The People’s Budget: A Roadmap for the Resistance” for Fiscal Year (FY) 2019, which calls for large increases in spending but enough new revenue to both offset that spending and put debt on a downward path as a share of the economy. The CPC's budget calls for $4.1 trillion of spending increases and $10.9 trillion of revenue increases, resulting in $6.8 trillion of total deficit reduction through 2028. Sliced another way, the budget calls for $13.3 trillion of tax increases and spending cuts and $7.5 trillion of new spending, spending increases, and targeted tax cuts. It would also reduce interest costs by nearly $1 trillion. Under the CPC’s budget, debt would decline as a share of the economy from 78 percent of Gross Domestic Product (GDP) today to 73 percent by 2028, rather than rising to 96 percent under current law. 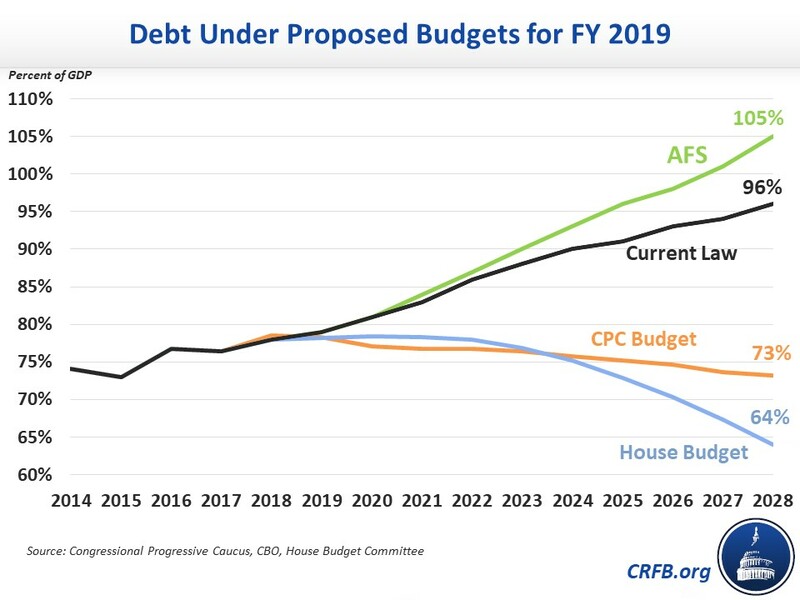 This is lower than where debt was headed in CPC’s proposal last year (over 75 percent of GDP) but higher than where debt would end up under the blueprint approved by the House Budget Committee (64 percent of GDP). Under the CPC's budget, revenues would rise from 16.6 percent of GDP this year to 22.9 percent by 2028, about 4.4 percent of GDP higher than under current law. Outlays would increase from 21.1 percent of GDP in 2018 to 25.1 percent in 2028, or about 1.4 percent of GDP higher than under current law. Deficits under the CPC budget spike in 2018 at 4.5 percent of GDP – 0.5 percentage points higher than current law – stemming from immediate implementation of a few public investment proposals. After this initial spike, deficits under the CPC budget would decline sharply to about 2 percent of GDP by 2020 and would remain around that level throughout the budget window. By comparison, the budget deficit would rise to 5.1 percent of GDP under current law and 7.1 percent under CBO's Alternative Fiscal Scenario. The largest spending increases in the CPC budget would come from areas like infrastructure ($2 trillion), universal child care ($1 trillion), and refinancing student loans while increasing college subsidies ($449 billion). In addition, the CPC plan would increase non-defense discretionary (NDD) spending by about $2.5 trillion over ten years ($1.5 trillion above post-sequester levels), which would allow for spending increases in a number of programs. Finally, the budget would expand the Child Tax Credit (CTC) and Earned Income Tax Credit (EITC) by roughly doubling the latter and nearly doubling the former for parents with young children. The budget also includes other smaller spending increases, such as $12 billion of funding to research transitioning to a state-based single-payer health system and $15 billion for an initiative to end family homelessness. To offset this new spending and reduce deficits, the CPC calls for substantially higher revenue and some targeted spending reductions. On the revenue side, the CPC budget targets a total $10.9 trillion of revenue without specifically itemizing how all of it would be raised. An accompanying Economic Policy Institute analysis explains that the revenue targets are designed to raise a fixed percent of GDP each year (4.4 percent of GDP) and notes that the total revenue increases are similar to the revenue raised in last year's CPC budget ($9 trillion) – which was itemized – plus the revenue loss from the 2017 tax law ($1.9 trillion). The largest revenue increase, $4.1 trillion, comes from excise and other taxes. Based on last year's budget, it is likely that about $2 trillion of this would come from taxes on financial transactions and institutions, $1 trillion from a carbon tax, and the rest from taxes on oil and large estates and the reinstatement of Superfund taxes, among other things. Importantly, actual revenue from a financial transaction tax is likely to be lower; the Tax Policy Center has estimated a revenue-maximizing tax would raise about $50 billion in its first year. Subtracting out the total effects of immigration reform, we estimate the CPC budget would raise another $3.6 trillion of revenue from individual income and payroll taxes. The budget is specific that it would establish new tax brackets for high earners at 45 percent for those making between $1 million and $10 million and up to 49 percent for those earning more than $1 billion, and capital gains and dividends would be taxed at the same rate as earned income. It would also eliminate the deduction for pass-through business income created in the 2017 tax law. Judging by last year's estimate of the tax rate increases ($1.6 trillion raised), additional tax increases would likely need to be specified to meet the target. Finally, the CPC budget calls for $2.2 trillion of additional revenue from corporate income taxes. The budget proposes reversing some of the international tax changes in the 2017 tax law that tend to lower taxes on foreign-earned income, limiting stock option deductions to cost rather than the current market value, eliminating fossil fuel tax subsidies, and limiting deductions for bonuses for employees making more than $1 million. Depending on how much the budget intends to roll back corporate tax cuts from the tax law, additional tax increases may be necessary. On the spending side, the CPC budget includes several health care changes. The plan would require Medicare to negotiate drug prices to save $489 billion (this is higher than estimates for any proposed negotiation or rebate options we are aware of), establish a public option with $78 billion in savings, and bolster generic manufacturers to drive down drug prices and save $25 billion (combined with provisions from the CREATES Act, prescription drug savings would total $29 billion). In addition, the CPC plan accelerates the use of bundled payments as an alternative to fee-for-service under Medicare, yielding an estimated $102 billion in savings. Additional spending reductions come from ending the wars in Iraq and Afghanistan and eliminating all overseas contingency operations (OCO) funding for them after FY 2018. Overall, the CPC budget calls for large increases to both spending and revenue. We worry that some of their numbers and many of their policies may be unrealistic or have unaccounted-for economic consequences. At the same time, we are pleased they take seriously the goal of not only paying for new proposals but also stabilizing the nation's fiscal situation. 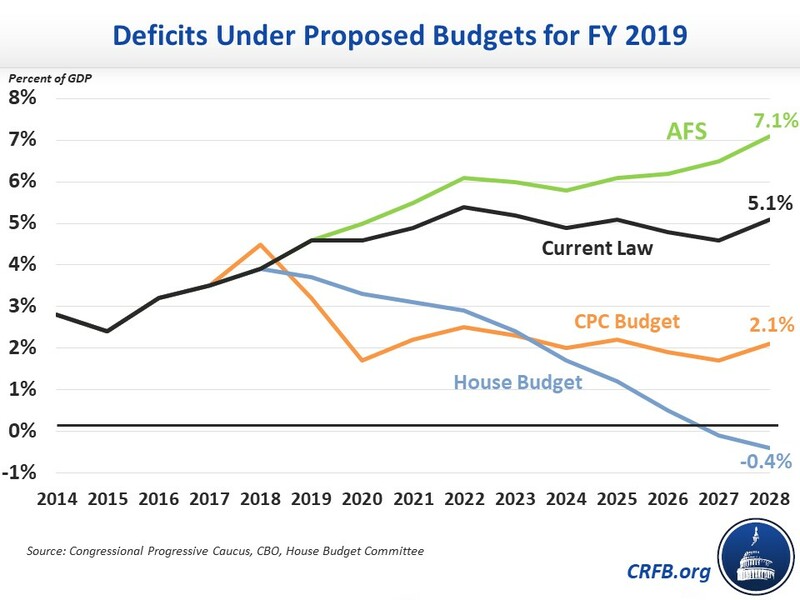 As in prior years, the Congressional Progressive Caucus's budget puts the debt on a downward path and would represent a substantial improvement over our current debt trajectory.